Tristam De Bolling was born 1075 in France, and died 1123 in England. This seemingly inconsequential detail is actually rather important. Suddenly the Family Tree has made a move from the De Boulogne, aka French detail, to the De Bolling, aka English version. Undoubtedly this has to do with Eustace's assistance in the Normandy invasion, the granting of English lands, the loss of them, and the restoration of some of them. There's just nothing like the booty from an invasion to switch allegiance from the Frogs to the Tea Sippers. John De Bolling was born 1120 in Kirkstall Abbey, Yorkshire, England, and died 1164 in England. William De Bolling was born 1140 in Yorkshire, England, and died 1246 in Norfolk, England. William De Bolling (II) was born 1165 in Yorkshire, England, and died Unknown in England. William De Bolling (III) was born 1190 in New Hall, England, and died Abt. 1258 in Kirkstall Abbey, Yorkshire, England. Robert De Bolling was born 1220 in Bolling Hall, Bradford, Yorkshire, England, and died 1258 in Bolling Hall, Bradford, Yorkshire, England. John De Bolling (II) was born 1232 in Bolling Hall, Bradford, Yorkshire, England, and died 1323 in Yorkshire, England. William De Bolling (IV) was born 1258 in Bolling Hall, Bradford, Yorkshire, England, and died 1316 in Bolling Hall, Bradford, Yorkshire, England. John De Bolling (III) was born 1284 in Bolling Hall, Bradford, Yorkshire, England, and died 1330 in Bolling Hall, Bradford, Yorkshire, England. Robert De Bolling (II) was born 1310 in Bolling Hall, Bradford, Yorkshire, England, and died 1370 in Bolling Hall, Bradford, Yorkshire, England. Married Elizabeth De Thornton 1337 in Bolling Hall, Bradford, Yorkshire, England. She was born 1314 in Bolling Hall, Bradford, Yorkshire, England, and died Abt. 1360 in Bolling Hall, Bradford, Yorkshire, England. John De Bolling (IV) was born 1340 in Bolling Hall, Bradford, Yorkshire, England, and died 1408 in Bolling Hall, Bradford, Yorkshire, England. Married Grace Papeley about 1357 in England. She was born 1344 in Bolling Hall, Bradford, Yorkshire, England, and died 1370 in Bolling Hall, Bradford, Yorkshire, England. Robert De Bolling (III) was born 1370 in Bolling Hall, Bradford, Yorkshire, England, and died 1423 in Bolling Hall, Bradford, Yorkshire, England. Married Margaret Thornoe. She was born 1374 in Bolling Hall, Bradford, Yorkshire, England, and died 1396 in Bolling Hall, Bradford, Yorkshire, England. Children: Robert Bolling (IV)... albeit without the "De"
Robert Bolling (IV) was born 1396 in Bolling Hall, Bradford, Yorkshire, England, and died 23 Oct 1457 in Bolling Hall, Bradford, Yorkshire, England. Married Isabel Thornton. She was born in Bolling Hall, Bradford, Yorkshire, England, and died in England. Tristam Bolling was born 1427 in Bradford, Yorkshire, England, and died 30 May 1502 in Bradford, Yorkshire, England. Married Beatrice Calverley about 1446 in Chellow, Yorkshire, England. She was born about 1427 in Calverley, Yorkshire, England, and died 1516 in Yorkshire, England. 2. Murmuring Ripple  ... unknown. Murmurming Ripple was an Algonquian (Algonquian) Indian in Virginia, born 1415, died 1495. Edward Bolling was born 1516 in Chellow, Yorkshire, England, and died 1543 in Chellow, Yorkshire, England. Married Magdaline Greene About 1540 in Chellow, Yorkshire, England. She was born 1520 in Yorkshire, England, and died 1561 in Chellow, Yorkshire, England. One might also note the first name of Edward's wife. Dashing Stream was an Algonquian Indian, born 6 May 1474. Tristam Bolling (II) was born 1530 in Chellow, Yorkshire, England, and died 1561 in Chellow, Yorkshire, England. Married Anne Rookes about 1555 in Chellow, Yorkshire, England. She was born about 1524 in Yorkshire, England, and died about 1560 in England. Scent Flower was born 3 June 1517, died in 1555 in Virginia. She was the daughter of Dashing Stream. Eustace Rolfe was born 1536 in Hoacham, England; died in 1593 in Norfolk, England. Edward Bolling (II) was born 1560 in Bradford, Yorkshire, England, and died 1592 in Chellow, England. Married Jane Greene about 1570 in Chellow, England. She was born in Bradford, Yorkshire, England, and died 1588 in England. Chief Wahunsonacock Powhatan was an Algonquian Chieftain, born 17 June 1545, died April 1618. He is known primarily on the basis of the many and varied legends concerning his daughter, Pocahontas. John Rolfe was born 1562 in Hoacham, England; died in 1594 in Norfolk, England. Robert Bolling (V) was born 1590 in Bradford, Yorkshire, England, and died 13 Nov 1639 in London, England. Married Anne Clarke 1614 in London, England. She was born about 1590 in London, England, and died about 1639 in All Hallows, Barking, London, England. Matoaka Pocahontas Powhatan was... yes... THE POCAHONTAS. Thought you'd like to see these reports from some research I was doing today and uncovered some interesting info. The "Descendants of ALONKIAN CHIEF" report includes none other than our 11th great-grandmother Pocahontas! (Daddy's 10th GG). Woo hoo! The "Dermod O'Sullivan" report traces back other ancestors from Lizzie Ward's (J.N. 's wife, and Clayton's mother) family that hailed from Ireland. Neal Ward, Grandfather Clayton's paternal grandfather, emigrated from Ireland as well. I am currently finishing up on other branches, including some that apparently date back to 903 A.D., and I'm not kidding. They were French Counts. I'll let you know if those pan out! This was great news... in part because the author's wife had mentioned, all together too many times, that she was descended from people who came to America on the Mayflower. And now... however, there was the fact that my ancestors had been here to meet the boat when her relative newcomers were just arriving. Wonderful news! But then... Shari then added in her next e-mail the fact that her search into certain "French Counts" led her to Louis IV, King of France. Now... the author having read a lot about lineages from Adam to the early kings of France, immediately realized that a trace back to Louis IV allowed for a seriously complete genealogy... i.e., the Mother Of All Family Trees! And thus the reason for ALL of this! Matoaka Pocahontas Powhatan was born 1595 in Tidewater, James City, Virginia, and died 21 Mar 1617 in Gravesend, England. Married John Rolfe 05 Apr 1614 in Jamestown, James City, Virginia. Pocahontas was a Native American woman who became a celebrity in London in the last year of her life. She was a daughter of Wahunsunacawh (also known as Chief or Emperor Powhatan), who ruled an area encompassing almost all of the neighboring tribes in the Tidewater region of Virginia (called Tenakomakah at the time). Her formal names were Matoaka (or Matoika) and Amonute; Pocahontas was a childhood nickname referring to her frolicsome nature (in the Powhatan language it meant "little wanton"). After her baptism, she went by the name Rebecca, becoming Rebecca Rolfe on her marriage. "Pocahontas the Kings dearest daughter, when no intreaty could prevaile, got his head in her armes, and laid her owne upon his to save him from death". Well... maybe. A bit of skepticism might be in order here. On the one hand, Smith's earliest mention of the event dates from 1616, despite his having written two books on Virginia prior to that (and completely failed to mention the rescue). In fact, the occasion of his telling the tale was in a letter entreating Queen Anne to treat Pocahontas with dignity. It is possible that Smith's earlier writings were simply not of the nature for such a tale... but then there's a similar tale by Smith in which he described being rescued through the intervention of a beautiful young girl after he was captured by Turks in Hungary in 1602. Oops. Still... Pocahontas can be credited with bringing provisions to the colonists... and in fact saving many of them from inevitable starvation. Such charity did not, however, go unnoticed by the Native Americans who were beginning to feel threatened by the insatiable needs of the white folk. On one occasion in 1608, there was allegedly a plot against Smith and his colonists, whereupon during a visit to Werowocomoco, they were temporarily delayed in their return. The idea was then to provide the white men with food... and when they had laid down their weapons to eat, to be attacked by the Indians. And of course, once again coming to the rescue was Pocahontas who warned Smith before hand. Thus forewarned, no weapons were laid down... and for whatever reason, there was no attack. When Smith was injured in a gunpowder explosion and had to return to England for medical care, Pocahontas was told that he was dead... an understanding she held until arriving in England a few years later, only in this case as the wife of John Rolfe. However, there is no suggestion that Pocahontas and Smith were ever lovers. Such romantics tend to be limited to animated Disney versions. There is another tale wherein Pocahontas was kidnapped by the English colonists, with the aid of a tribe of other indians. The apparent goal was to use her as ransom for some English prisoners held by Chief Powhatan. The colonists were, of course, not obliged to keep their end of the bargain and Pocahontas was held in captivity for roughly a year... during which Pocahontas improved her English, learned about Christianity, was baptized, and took the name Rebecca as her English name. Pocahontas may have even reached the point where she preferred to live with the English. "the unbridled desire of carnal affection, but for the good of this plantation, for the honor of our country, for the Glory of God, for my own salvation… namely Pocahontas, to whom my hearty and best thoughts are, and have been a long time so entangled, and enthralled in so intricate a labyrinth that I was even a-wearied to unwind myself thereout." Poca and Rolfe were married on April 5, 1614 -- her never having returned to her father and her tribe after her kidnapping. For purposes of the marriage, Pocahontas was christened Lady Rebecca. For a few years after the marriage, the couple lived together on Rolfe's plantation, Varina Farms, which was located across the James River from the new community of Henricus. They had a child, Thomas Rolfe, born on January 30, 1615. Amazingly enough, their marriage was unsuccessful in winning the English captives back... the standoff continued. However, the glorified John marrying a heathen... did create a climate of peace between the Jamestown colonists and Powhatan's tribes for several years. Furthermore, Pocahontas was even used as an enticement and evidence of the good times to be had in Virginia... especially for new colonists and wealthy investors (in what was the failing enterprise called Jamestown). In the spirit of true irony, John and Poca left Jamestown, along with a small group of eleven other Powhatan natives. In other words, they bailed... in order to tell others just what a cool place Virginia was in the spring of 1616. It was at this juncture, of course, that Pocahontas learned that Captain John Smith was still alive. They apparently did not meet at this point in time, but Smith did write a letter to Queen Anne that Pocahontas be treated as a royal visitor... because... if she were treated badly, her "present love to us and Christianity might turn to… scorn and fury", and England might lose the chance to "rightly have a Kingdom by her means". Now... this is true English hospitality! Pocahontas was promptly given the royal treatment... from society gatherings to banquets with the King... and even a bit of so-called nights on the town, enjoying a performance of Ben Jonson's masque The Vision of Delight. But the best part was that, according to Smith, King James was so unprepossessing that neither Pocahontas nor her shaman companion realized whom they had met until it was explained to them afterward. You remember James, right? Just one of the guys! In March 1617, Rolfe and Pocahontas boarded a ship to return to Virginia. However, the ship had only gone as far as Gravesend on the River Thames when Pocahontas became ill. The nature of the illness is unknown, but since she had been described as sensitive to London's smoky air, pneumonia or tuberculosis are likely, although smallpox has also been suggested. She was taken ashore and died. Pocahontas and Rolfe had one child, Thomas Rolfe, who was born at Varina Farms in 1615 before his parents left for England. Through this son Pocahontas has many living descendants. Many First Families of Virginia trace their roots to Pocahontas and Chief Powhatan, including such notable individuals as Edith Wilson, wife of Woodrow Wilson; George Wythe Randolph; Admiral Richard Byrd; Virginia Governor Harry Flood Byrd; fashion-designer and socialite Pauline de Rothschild; former First-Lady Nancy Reagan; and astronomer and mathematician Percival Lowell (mathematical founder of Pluto). "Matoaka, alias Rebecca, daughter of (filia) the most powerful (potentiss[imi]) prince (princ[eps] of the Powhatan Empire (imp[erii]) of Virginia." In this manner, some contemporary English recognized Wahunsunacock as ruler of an empire, and presumably accorded what they considered as appropriate status to Pocahontas (Matoaka). This is supported by Captain John Smith's 1616 letter of recommendation to Queen Anne (King James' wife) concerning Pocahontas, which refers to "Powhatan their chief King". The town of Pocahontas, Virginia. Pocahontas, Iowa is in Pocahontas County. Fort Pocahontas, an American Civil War fortification in Charles City County, Virginia. Pocahontas State Park in Chesterfield Virginia. Pocahontas Village, a neighborhood in Virginia Beach, Virginia. A river tour boat operated from Gravesend in London, UK. Four United States Navy ships named USS Pocahontas and one named USS Princess Matoika. In Henrico County, Virginia, Pocahontas Middle School and John Rolfe Middle School -- thus reuniting the historic couple in the local educational system—Henrico being one of 5 remaining original shires that date to the early 17th century of the Virginia Colony. John Rolfe born 1585 in England; died 1622 in Jamestown. John Rolfe was one of the early English settlers of North America. He is credited with the first successful cultivation of tobacco as an export crop in the Colony of Virginia and is primarily known as the husband of Pocahontas, daughter of the chief of the Powhatan Confederacy. Rolfe was born in Heacham, Norfolk, England as the son of John Rolfe and Dorothea Mason, and was baptized on May 6, 1585. At the time of Rolfe's ascendancy, Spain held a virtual monopoly on the lucrative tobacco trade. Most Spanish colonies in the New World were located in southern climates more favorable to tobacco growth than the English settlements, notably Jamestown. As the consumption of tobacco had increased, the balance of trade between England and Spain began to be seriously affected. Rolfe was one of a number of businessmen who saw the opportunity to undercut Spanish imports by growing tobacco in England's new colony at Jamestown, in Virginia. Rolfe had somehow obtained seeds to take with him from a special popular strain then being grown in Trinidad and South America, even though Spain had declared a penalty of death to anyone selling such seeds to a non-Spaniard. In 1609, Rolfe heeded the advice of "Go west, young man, go west," and sailed from England with his wife and small child. They had embarked, along with hundreds of new settlers and a huge load of supplies for Jamestown, on a seven ship armada, led by the flagship Sea Venture. However, somewhere in the southern Atlantic ocean (*), they encountered a three day-long storm, thought to have been a severe hurricane. The ships of the fleet became separated, and the new Sea Venture, whose caulking had not cured... are you kidding me?... was taking on water faster than it could be bailed. The Admiral of the Company, Sir George Somers, took the helm and the ship was deliberately driven onto the reefs of Bermuda to prevent its foundering. All aboard, 150 passengers and crew, and 1 dog, survived. Most remained for ten months in Bermuda, subsequently also known as The Somers Isles, while they built two small ships to continue the voyage to Jamestown. A number of passengers and crew, however, did not complete this journey. Some had died or been killed, lost at sea (the Sea Venture's long boat had been fitted with a sail, and several men sent to take word to Jamestown, and they were never heard from again), or left behind to maintain England's claim to Bermuda. Because of this, although the Virginia Company's charter was not extended to Bermuda until 1612, the Colony at Bermuda dates its settlement from 1609. Among those left buried in Bermuda were Rolfe's first wife and child. (*) One might wonder what in the world the Sea Venture and the fleet were doing in the area of Bermuda -- even ignoring all of those tales about the Bermuda Triangle. The reason is that the sailors of the day had not figured out what Nathaniel Bowditch would later demonstrate as obvious... that the route to follow in partially circumnavigating a globe is that the by-far shortest route is a Great Circle route. This is why flights from Los Angeles to London to Moscow would fly over the North Pole. Prior to Bowditch, sailors were taking the far longer route along circles of a given latitude. In May 1610, the two newly-constructed ships set sail from Bermuda, with 142 castaways on board, including Rolfe and Admiral Somers. On arrival at Jamestown, they found the Virginia Colony almost destroyed by famine and disease during what has become known as the Starving Time. Very few of the supplies from the Third Supply had arrived (the same hurricane which caught the Sea Venture had also badly affected the rest of the fleet), and only 60 settlers remained alive. It was only through the arrival of the two small ships from Bermuda, and the arrival of another relief fleet in June 10, 1610 that the abandonment of Jamestown was avoided and the colony was able to survive. After finally settling in, although his first wife and child had died, Rolfe began his long-delayed work with tobacco. In competing with Spain for European markets, there was another problem beside the warmer climates the Spanish settlements enjoyed. The native tobacco from Virginia was not liked by the English settlers, nor did it appeal to the market in England. However, Rolfe wanted to introduce sweeter strains from Trinidad, using the hard-to-obtain Spanish seeds he brought with him. In 1611, Rolfe is credited with being the first to commercially cultivate Nicotiana tabacum tobacco plants in North America; export of this sweeter tobacco beginning in 1612 helped turn the Virginia Colony into a profitable venture. Rolfe named his Virginia-grown strain of the tobacco "Orinoco", possibly in honor of tobacco-popularizer Sir Walter Raleigh's expeditions in the 1580s up the Orinoco River in Guiana in search of the legendary City of Gold, El Dorado. The appeal of Orinoco tobacco was in its nicotine, and the conviviality of its use in social situations. John Rolfe was now in a position to attract a princess... which he promptly did, marrying Pocahontas. The couple set up housekeeping on land provided by John's father-in-law. Their son, Thomas Rolfe, was born there. Then in 1616, on what might be called a "public relations trip" for the Virginia Company, Rolfe and Pocahontas headed back to England with their baby son. After Pocahontas' death, Thomas Rolfe stayed in England while his father returned to Jamestown. Eventually, John Rolfe married his third wife, Jane Pierce. They had a daughter, Elizabeth, in 1620. Elizabeth died in 1635 at the age of 15. Thomas Rolfe, the son of Pocahontas and John Rolfe, later returned to Virginia, where he was accepted by both the Powhatans and the English settlers. He married an English settler, and through their children, many First Families of Virginia trace their roots to both an English and Native American heritage. John Bolling (V) was born 1615 in All Hallows, Barking, London, England, and died 11 Nov 1648 in London, England. Married Mary Carie 23 Nov 1640 in London, England. She was born 1620 in London, England, and died 11 Nov 1648 in London, England. Bolling Hall: With reference to John's son, Robert: "His father John, was one of the Bollings of Bolling Hall, near Bradford, England." Bolling Hall is one of the oldest buildings in Bradford, West Yorkshire, England. It is currently used as a museum and education center. The building is about a mile from the centre of Bradford. Its surroundings are suburban in character. The Manor of Bolling (Bollinc) is first mentioned in Domesday Book and was at that time in the possession of a man named Sindi. The manor then came under the control of Ilbert de Lacy. By 1316 the manor was owned by William Bolling, and Bollings owned the estate until the late 1400s when control went to the Tempests who held the estate until 1649. The estate changed hands several times thereafter until eventually it was let to several tenants until being presented to Bradford Corporation in 1912. It was opened as a museum three years later. During the second siege of Bradford in 1643, during the English Civil War, the house was a Royalist base. On this occasion the Royalists took the town, which had strong Parliamentarian sympathies, and it was thought that the victors would put the inhabitants to the sword. There is a legend that a ghost appeared in the bedroom where the Royalist commander Earl of Newcastle was staying to tell him to "Pity poor Bradford". There is usually material on display relating to the English Civil War including a death mask of Oliver Cromwell. In the eighteenth century parts of the house were modernized by the architect John Carr, following a fire. The Bolling chapel at Bradford parish church, now Bradford Cathedral, was restored by the Tempest family in the seventeenth century but did not survive the twentieth-century rebuilding of the Chancel. Thomas Rolfe was the son of Pocahontas and John Rolfe. Thomas Rolfe (January 30, 1615 - c. 1675) was the only child of Pocahontas by her English husband John Rolfe. Thomas was born at Smith's Plantation in Jamestown, Virginia. After growing up in England, on 13 September 1632 he married Elizabeth Washington, at St James's church, Clerkenwell, London, and their daughter Anne was born in 1633. Elizabeth died shortly after Anne’s birth, and in 1635 Rolfe returned to Virginia, leaving his daughter with his cousin Anthony Rolfe. In 1659, Anne Rolfe married Peter Elwin (1623-1695), of Thurning, Norfolk, England, and left descendants. Rolfe became a powerful leader in the tribe Powhatan, named after the chief who was the father of Pocahontas, and met and married Jane Poythress. He served in the English military until 1675. His only child by his second wife, called Jane Rolfe, was born on October 10, 1650, and in 1675 married Colonel Robert Bolling and herself had a single child, ("Major") John Fairfax Bolling (born January 26, 1676). Many Americans claim descent from Rolfe, including some politicians. In 1675, Rolfe died at the age of 59 or 60, and was survived by his wife and child. As a result of Thomas Rolfe's birth, the Rolfe family is considered one of the First Families of Virginia. He appears as an infant in the 2005 theatrical film The New World but does not exist in the 1998 Disney animated straight-to-video film Pocahontas II: Journey to a New World, a sequel to the 1995 motion picture. Rolfe is buried in Hopewell's Kippax Plantation. "Colonel" Robert Bolling (V) was born 26 Dec 1646 at Tower Street, All Hallows, Barking Parish, London, England, and died 17 July 1709 in Kippax, Charles City, Virginia... having come to the colony in Virginia, arriving in October 2, 1660, at the age of fourteen. 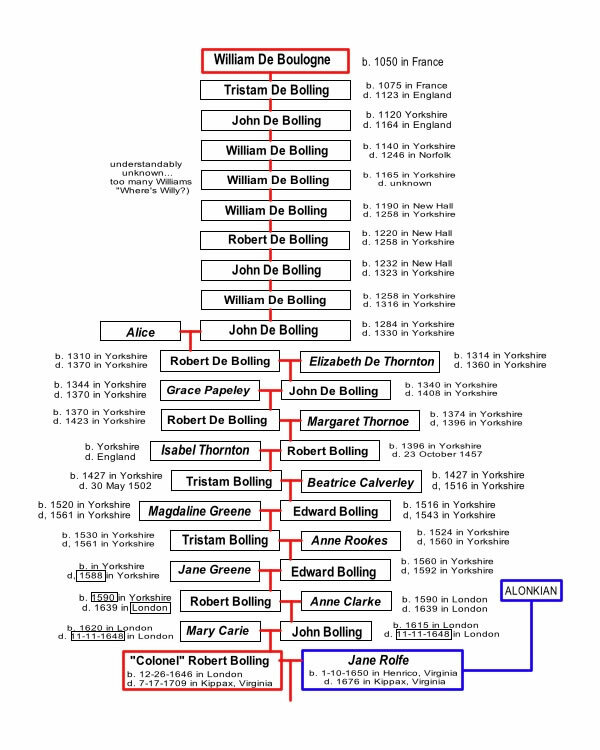 He was the son of John and Mary (Carie) Bolling, and according to Bolling family (oral) tradition, the original deBolling family was Norman French, and came to Barking Parish with William the Conqueror. He became known as a wealthy early American settler, planter, and merchant. First Marriage: Jane Rolfe 1675 in Petersburg, Virginia, daughter of Thomas Rolfe and Jane Poythress. Robert was 28 years old at the time. She was born 10 Oct 1650 in Varina, Henrico, Virginia. In about 1675, she married Robert Bolling of Prince George County, Virginia, and they had their only child, John Bolling, on January 26, 1676. She died 1676 in Kippax, Charles City, Virginia... within a year of her marriage, and quite possibly due to complications in giving birth to her only child. Second Marriage: Anne Stith (married in 1681). She was the daughter to John Drury and Jane (Gregory) Stith. - (unnamed) Bolling (b. 1682), died young. - Stith Bolling (1686-1727), married Elizabeth Hartwell. - Edward Bolling (1687-1720), married Ms. Slaughter. - Anne Bolling (1690-1750), married Robert Wynne. - Drury Bolling (1695-1726), married Elizabeth Meriwether. - Agnes Bolling (1700-1762), married Richard Kennon. As a merchant and planter, Bolling acquired a large estate. He was colonel of the militia and was a member of the House of Burgesses from Charles City County in 1702. After his death, Robert Bolling was buried on his plantation Kippax, in Prince George Co., Virginia, where his tomb still stands. However, in 1858, his remains were removed from Kippax to the Bolling mausoleum at Blandford Cemetery in Petersburg, Virginia, a mausoleum erected by his great grandson. "Major" John Fairfax Bolling was born 27 Jan 1676 in Kippax, Charles City, Virginia, and died 20 Apr 1729 in Cobbs, Henrico, Virginia. Jane Bolling (1698-1766), married Colonel Richard Randolph. John Bolling Jr. (1700-1757), married 1. Elizabeth Lewis; 2. Elizabeth Bland Blair. Elizabeth Bolling (b. 1709), married William Gay. Mary Bolling (1711-1744), married John Fleming. Martha Bolling (1713-1737), married Thomas Eldridge. Anne Bolling (1718-1800), married James Murray. Another child who may be a daughter of John Bolling and Mary Kennon, although not named in his will was Penelope (c. 1700-1776), who married Captain Christopher Clark, and had a son Bolling Clark, two grandsons Bolling Clark, a grandson Bolling Clark Anthony, and several other descendants named "Bolling," "John Bolling," or, indeed, "Rolfe Bolling." Penelope may alternatively have been the daughter of Edward, the son of Arthur Johnston, and Elizabeth Walker. Indeed, this is the more likely of the two possible origins of Penelope, as a birth record of daughter Penelope has survived. In this case, the various descendants of Penelope named Bolling would have been named in honor of a member or members of the Bolling family. According to Wikipedia: Major John Fairfax Bolling was a colonist, farmer, and politician in the Virginia Colony. He made his home at the Bolling family plantation "Cobbs" just west of Point of Rocks on the north shore of the Appomattox River downstream from present-day Petersburg, Virginia. (Cobbs was located in Henrico County until the area south of the James River was subdivided to form Chesterfield County in 1749). Major Bolling served in the Virginia House of Burgesses from 1710 until his death. In 1722, he opened a tobacco warehouse in what is now the 'Pocahontas' neighborhood of Petersburg. William Byrd II of Westover Plantation is said to have remarked that Major Bolling enjoyed "all the profits of an immense trade with his countrymen, and of one still greater with the Indian." 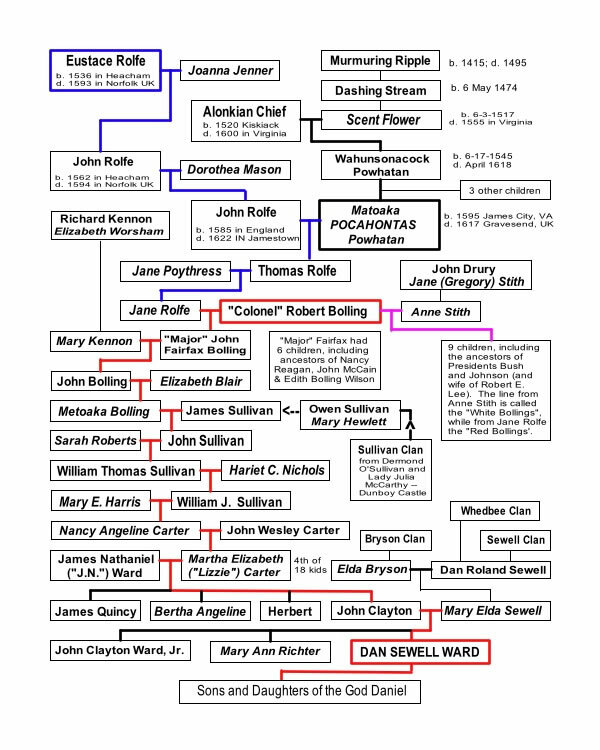 John and Mary Bolling's descendants are the only American descendants of Pocahontas, and include Edith Bolling Galt Wilson, wife of U. S. President Woodrow Wilson, Percival Lowell, who mathematically discovered Pluto, Harry Flood Byrd and Richard Evelyn Byrd, the Randolphs of Roanoke, Nancy Reagan, and John McCain. John Bolling was born 20 Jan 1700 in Cobbs, Henrico, Virginia, and died 06 Sep 1757 in Cobbs, Henrico, Virginia. Married Elizabeth Blair on 1 August 1728 in Chesterfield, Virginia. She was born 20 Jan 1709 in Williamsburg, James City, Virginia, and died 22 Apr 1775 in Cobbs, Chesterfield, Virginia. Metoaka Bolling was born on 3 July 1729 in Petersburg, Dinwiddie, Virginia, and died 22 Apr 1775 in Virginia. Married James Sullivan 15 June 1743 in Virginia, son of Owen Sullivan and Mary Hewlett. He was born 1729 in Twittys Creek, Charlotte, Virginia, and died 1809 in Laurens, South Carolina. Owen Sullivan (=Mary Hewlett)  can trace his lineage back to his father, Owen Sullivan (=Elizabeth Claiborne)  -- and thence back to another five generations of O’Sullivan (of which three included an Owen as the heir’s name), all the way back to Dermod O’Sullivan (~1520 to 1549) [Generation No. 151]. Dermod had married Lady Julia MacCarthy who hailed from Carberry, Ireland (born ~1500; died 1550). They lived at Dunboy Castle, Munster, Ireland. The name change from O’Sullivan to Sullivan apparently came about when Dermod’s great, great grandson, John T. O’ Sullivan, immigrated from Ardee, Louth, Ireland, to Lynhaven Parish, Prince William, Virginia; some time between 1637 and 1673 (the latter date being when he married Mary Hayes on 10 June 1673. The story of Dunboy Castle (see below), pretty well explains why the O’Sullivans began looking greener pastures (even greener than Ireland). Dermod O'Sullivan Lord Beara Of Dunboy was also known as Dermod O’Sullivan, The Powdered. He was the 11th Lord of Beare and Bantry, of Dunboy Castle. (Donnell Mor, was the 8th Lord in descent from the first who assumed the name O’Sullivan, and a lineal descendant of Eogan More, who in turn was the 25th in descent from Olioll Olum (early 3rd Century CE), the 237th Monarch of Munster, Ireland, through his son, Owen. Donnell Mor’s great-grandson, Aura-Ny-Lacken, Lord of Desmond, was the 1st Lord of Beare and Bantry in Munster and direct ancestor of Dermod, the 11th Lord. BTW, Olioll Olum's father-in-law as Con of the Hundred, King of Ireland (125-145). According to Wikipedia: Dunboy Castle (Caisleán Dhún Baoi) was a stronghold of the O'Sullivan Beare, a Gaelic clan leader and 'Chief of Dunboy'. The castle is located on the Beara Peninsula in south-west Ireland near the town of Castletownbere and was built to guard and defend the harbour of Berehaven. Its presence there enabled O'Sullivan Bere to control the sea fisheries off the Irish coast and collect sizeable taxes from Irish and Continental fishing vessels sheltering in the haven. It was also a centre for the import/export trade to and from the Continent. Today, much of the castle is destroyed but the ruins are open to the public. Meanwhile, one can see just how much fun a genealogical search can generate! John Sullivan was born in February 1756 in Caroline, Virginia, and died 14 Nov 1839 in Edgefield, South Carolina. Married Sarah Roberts. She was born 1756 in Georgia, and died 1839 in Georgia. William Thomas Sullivan was born on 1 June 1805 in Hancock, Georgia, and died 06 Nov 1871 in Toto Roberts, Parker County, Texas. Married Hariet C Nickles (Nichols) 1826. She was born 15 Sep 1805 in Giles County, Tennessee, and died 12 July 1878 in Toto Roberts, Parker County, Texas. William J. Sullivan was born 28 February 1828 in Tennessee, and died 11 Dec 1907 in Parker County, Texas. Married Mary E Harris. She was born 27 Jan 1836 in Tennessee, and died 12 July 1912 in Parker County, Texas. Nancy Angeline Carter was born on 02 Apr 1857 in Roberts, Parker County, Texas, and died 18 February 1943 in Central, Parker County, Texas. Married: John Wesley Carter on 12 Mar 1874 in Weatherford, Parker County, Texas. He was born on 8 Apr 1849 in Sabine, Louisiana, and died 23 July 1920 in Central, Parker County, Texas. Mary Angeline Carter, born on 18 Dec 1874 in Advance, Parker County, Texas; died before 1957. William David Carter, born on 13 Dec 1875 in Parker County, Texas; died 8 Oct 1876 in Parker County, Texas. Martha Elizabeth "Lizzie" Carter, born on 31 Dec 1876 in Parker County, Texas; died 3 Sep 1957 in Weatherford, Parker County, Texas. John B Carter, born 8 February 1878 in Parker County, Texas; died 14 February 1905 in Parker County, Texas. Rhonda Francis Carter, born 29 August 1879 in Parker County, Texas; died after 1957. She married ? Freeman. Albert Carter, born 27 Oct 1880 in Parker County, Texas; died after 1957. Maggie Josephine "Molly" Carter, born 26 Jan 1882 in Parker County, Texas; died after. 1957. She married ? Stevens. Lula J Carter, born 12 February 1883 in Parker County, Texas; died before 1957. Bertie A Carter, born 7 February 1884 in Parker County, Texas; died after 1957. She married "Husband" Easley. Sammy C Carter, born 4 June 1886 in Parker County, Texas; died 28 Oct 1886 in Parker County, Texas. William James "Jim" Carter, born 4 June 1886 in Parker County, Texas; died after 1957. Ollie Florence Carter, born 25 Jan 1888 in Parker County, Texas; died after 1957. She married "Husband" Burns. George Riley Carter, born 21 June 1889 in Parker County, Texas; died 5 Nov 1958 in Weatherford, Parker County, Texas. Laura Carter, born 7 Apr 1891 in Parker County, Texas; died after 1957. She married ? McKnight. Ethel M Carter, born 5 Sep 1892 in Parker County, Texas; died after 1957. She married "Husband" Henderson. Ella Carter, born 27 Apr 1895 in Parker County, Texas; died 22 May 1895 in Parker County, Texas. Bessie Carter, born 21 Oct 1896 in Parker County, Texas; died 21 Oct 1896 in Parker County, Texas. Hubert Elmer Carter, born 16 Sep 1902 in Parker County, Texas; died 25 Dec 1923 in Parker County, Texas. Obviously, one must take their hat off to Nancy Angeline (and to a lesser degree, John Wesley). And now... time for the home stretch... pardon whatever puns might be lurking there.